Surface finish specialist Armourcoat has been specified throughout the VIVI restaurant, a new 1960’s inspired eatery opening in the Centre Point Building in London’s West End. VIVI promises to deliver traditional British food with an innovative twist. 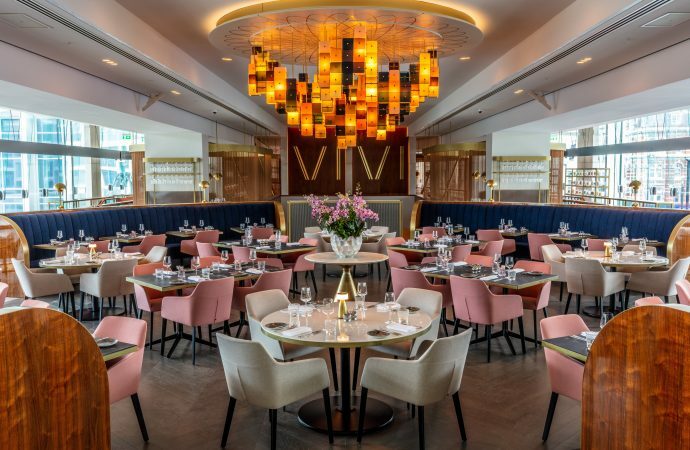 VIVI’s 290-cover dining room serving delicious British favourites, has its interior design inspired by 60s colours and fabrics, including a handmade chandelier by Danish designer Vibeke Fonnesberg Schmidt. The new restaurant, created by rhubarb, the team behind Sky Garden and Verdi Italian Kitchen at the Royal Albert Hall, is part of a wider refurbishment of Richard Seifert’s celebrated Grade-II listed high-rise tower. Designed to optimise the acoustics of interior spaces, the Armourcoat Acoustic plaster system offers a clean and smooth mineral surface that can be applied seamlessly over large expanses to both flat and curved surfaces. Comprising of a special mineral wool composite panel that is bonded onto the substrate and finished with a seamless layer, the system presents an elegant marble-based plaster finish while allowing sound energy to pass through the surface. The system was recently granted the Quiet Mark Award, the international mark of approval from the Noise Abatement Society Charitable Foundation.